With Jen out of town, even after my culinary bachelor lifestyle escapades, the week's farm share backed up substantially. The great thing about the farm share is the substantially lowered grocery bills. The unfortunate thing is the immense amount of vegetables that back up if you're not careful. After Jen arrived last night, or early this morning depending on your point of view, it was time to make the most of our time and get to work on clearing up some fridge space to make way for tomorrow's new batch of vegetables. I used up some ciabatta from the freezer, leftover mozzarella cheese, farm tomato, and basil pesto that has been aging remarkably well in the fridge. I made these grilled cheese sandwiches and served them with the remaining potato chips and pickles. You may recall me mentioning Jen's disdain of sandwiches for dinner. However, this disdain is only in effect for dinner. 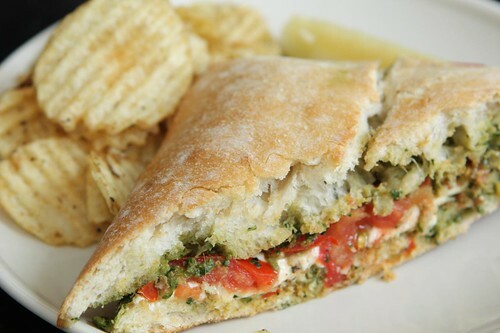 Sandwiches are totally fine for lunch. The rules are like second nature after a while. 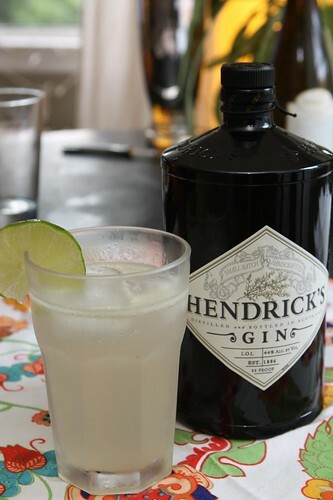 Jen made a fantastic gin gimlet fizz with some Hendrick's Gin. This marks the first time in over a decade that we've purchased any gin that wasn't Bombay Sapphire. Are our tastes changing after all this time? Hendrick's gin may be the only thing containing cucumbers that I've ever enjoyed consuming. The unfortunate thing about the end of the week is that the composition of meals is a bit off. Tonight's salad was a little bit purple. 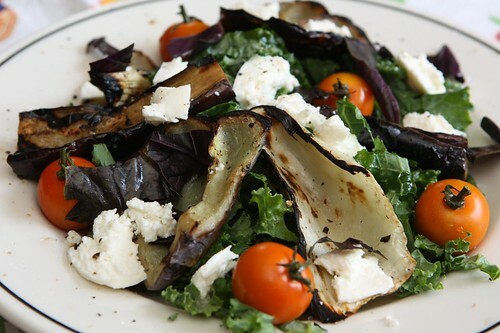 Kale, balsamic vinegar, eggplant, lilac peppers -- it was all very purple. Even with the grilled fennel and sin gold (which may be a typo for sun gold) tomatoes didn't unpurple it quite enough. So I gave up and tossed in some torn opal basil leaves. If you're going to go purple, you might as well go all in. 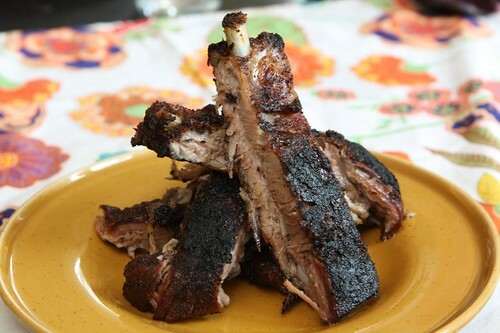 This afternoon I slow cooked some St. Louis ribs in the oven with a simple barbecue rub. It was pouring rain all morning but it was also about 90 degrees so this made the apartment a rather terrible place to be. That being said, after biting into some slow roasted grilled ribs it was all worth it. 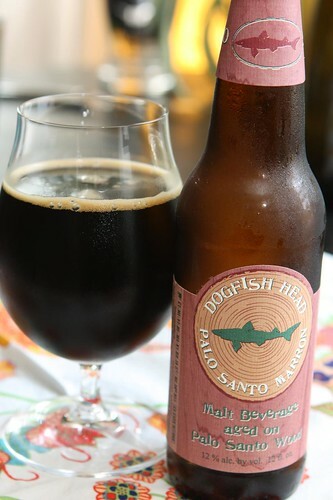 This Palo Santo Marron from Dogfish Head Craft Brewery has been in the fridge for quite some time. Partly because I wasn't ever sure what to pair it with. Mostly because it was 12% alcohol which is a little dangerous. It turns out that it was a fantastic accompaniment to some barbecue. It also turns out that at 12% is a lot of %. 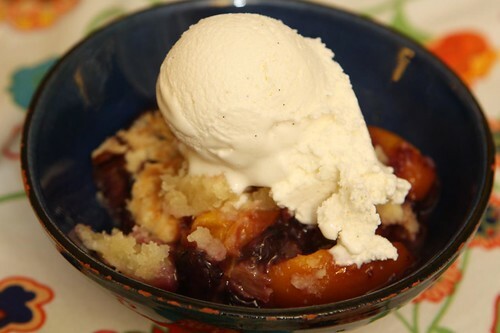 While the grill was heating up I tossed together the peaches and nectarines from the farm along with some blueberries, sliced rhubarb, lime juice, sugar, cornstarch and a touch of salt. I made a quick topping with flour, butter, sugar, and salt and tossed it into the oven. With the cobbler in the oven and the grill heating up we walked to Longford's, picked up some Tahitian vanilla ice cream, and made it back in time to throw this whole dinner together. And as soon as we were done eating the skies opened up and huge thunderstorm swept through out neighborhood. Now that, my friends, is time management! Labels: beer, Cleaning out the freezer, Cocktails, Dessert, How'd we use it? In a small saucepan, combine the water, sugar, and zest. Bring to a very low simmer for a few minutes, whisking constantly, just long enough for the sugar to dissolve. Remove from heat and let sit until it reaches room temperature. Pour through a mesh strainer to remove the zest. Add the lime juice. For the drinks, combine the lime syrup and gin. Divide between two glasses and add ice. We followed these directions but also added some soda water for the "fizz" element. What, no one wanted to know where you buy beer with a pink label? You are on a roll, sir. Just wait until you see tonight's beer!